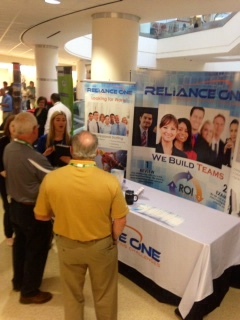 Auburn Hills, MI – Reliance One participated in the 16th Annual FCA MatchMaker event on Thursday, September 17, 2015. The event is just one of the many initiatives taken at FCA to foster the innovation and ingenuity that results from diversity. The MatchMaker event is held annually and is meant to facilitate long-term business relationships between Minority Suppliers, FCA, and FCA Tier 1 Suppliers. Collectively, it generates about $2.3 billion in new business development for companies that participate. This was the 8th year Reliance One attended the event with the hopes of connecting with new companies as well as helping prospective candidates find the right opportunity. We have benefited from the MatchMaker in the past but this year’s event exceeded our expectations. We appreciate FCA for providing us the opportunity to grow our brand and strengthen and gain key relationships. Thank you to FCA and everyone who participated for allowing us to be a part of this rewarding event. We are looking forward to next year!